This is a guest post by Kurt Jacobson, who runs the Fast and Furious Cook blog. Thanks, Kurt! I just got back from a class about cooking with spices at the International Culinary Center in New York City. At the end of the four hour class we were given a few minutes to ask questions, and one of the questions was, “what do you see as the current hot culinary trends?” The chef answered “kale,” which is no surprise to me. 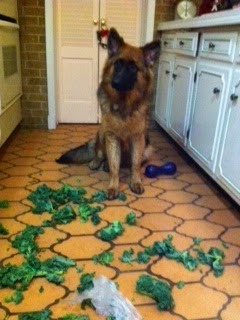 What was a surprise to me was the picture that was texted to me while I was in class showing my little angel of a 9 month old puppy who had just destroyed a bag of kale the pet sitter left unattended for 2 minutes! Don’t you just love the look of innocence on his face? So you know it’s a hot food trend when even dogs are unafraid to commit a crime to get some. I suspect I’m not the only one who grew kale this summer and had great results? I found many a way to cook with it and use it in salads too. Most days when I went out to the garden to pick some I would toss a leaf to my puppy who loved the stuff. Turns out that it’s good for dogs and many do like it. Now that the growing season is over I still long for that abundance I had in my little raised bed out back. I also had a great summer of growing, eating, canning and freezing tomatoes. If you also had an abundance of tomatoes and put some in the freezer or canned a bunch like me it’s time to cook some up. With this really cold and crappy weather there’s nothing better than a hearty bowl of soup and my Italian Tomato Soup fits the bill. This soup uses plenty of tomatoes (that you grew) and can be made with spinach or kale. It cooks in less than an hour and is guaranteed to warm you up. 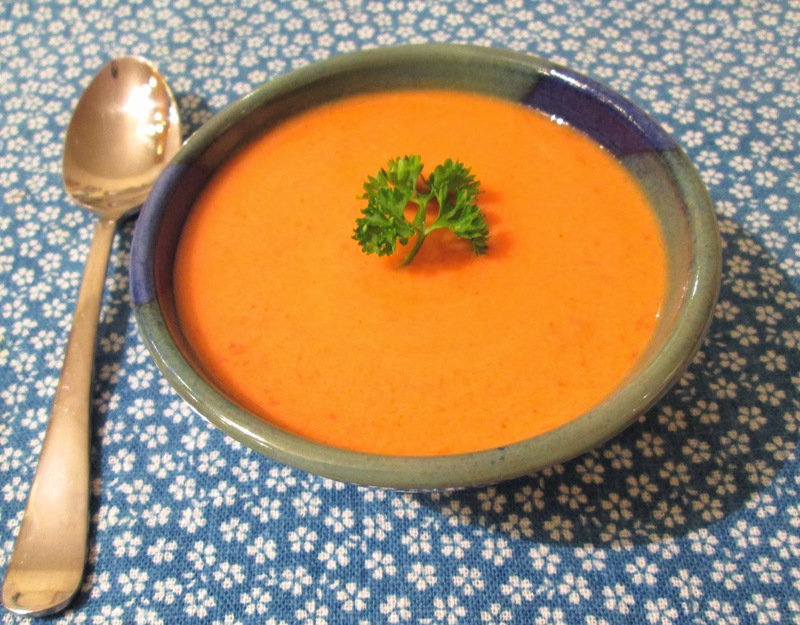 For those of you who want something simpler, try my 15 Minute Cream of Tomato Soup. This is one of my favorites when I am in a hurry but want home made soup. Remember this. If you spend less time cooking you can spend more time shopping the seed and garden catalogs! So from the Fast and Furious Cook I wish you all a happy holiday season and a hot bowl of healthy soup! In a one and a half to two quart pot saute shallots in oil on medium low heat until soft, about 3-5 minutes. Be careful not to brown the shallots. Add flour and cook for another 3 minutes stirring often. Add tomatoes, milk, bouillon, and turn up the heat to medium high stirring constantly. When soup starts to simmer turn off heat. If you want a smooth soup blend with an immersion blender and strain. You can also use a table top blender, but use caution with hot soup in it. It’s best to blend it in two parts for safety when using a table top blender. Note: You can add 1/2 teaspoon dried basil for a nice tomato basil soup. This soup doesn’t have to be blended if you don’t mind a chunky tomato soup. I like to use organic tomatoes for this soup. In a 4-5 quart pot add enough of the water to cover the bottom about a quarter inch and heat to simmering. Add onion and garlic and cook on medium low for 5 minutes stirring occasionally. Add canned tomatoes, beans, red pepper flakes, rest of the water, V-8, bouillon cube, and dried herbs. Cook at a simmer for 20 minutes, covered, stirring twice. Remove cover, turn heat up to a boil, and add pasta, stirring every 30 seconds for three minutes to keep the pasta from sticking to the bottom. Cook for 8 minutes uncovered, keeping it at a slow boil. Stir in broccoli and cook for 3 minutes simmering. Stir in spinach and cook for 3 minutes. Stir in parsley and serve. Note: This is a thick soup, but you can add an additional cup water if you want it thinner. Green beans can be substituted for broccoli. Recipes look yummy! Please let us know if you puppy responds similarly to other vegetables! Happy holidays to you and thanks for all you do for this blog!